This article appeared in the December 2010 edition of Américas magazine. Photos by John G. Stebbins. On the evening of September 15, Lorena Valladares Barragán and a carful of relatives arrived in the town of Dolores Hidalgo—the cradle of Mexico’s independence—prepared to camp out in the plaza if necessary. Even though they hadn’t been able to get a hotel reservation, Valladares said, they wanted to mark the bicentennial of independence at the place where it all began. And so she and her mother spread out their jackets on an unoccupied patch of grass within sight of the towering ornate church where on September 16, 1810, Father Miguel Hidalgo called on the people to rise up against their Spanish rulers—and where in a few hours President Felipe Calderón would arrive by helicopter to recreate the moment in history. In a year in which Mexico is marking both the bicentennial of its struggle for independence from Spain and the centennial of its revolution against another version of autocratic rule, this September whole towns seemed to be covered in red, white, and green. One common observation from the pundits was that with all of its current problems, including violence and poverty, Mexico had little reason to party. In fact, Ciudad Juárez and a few other northern cities and towns affected by drug-related violence canceled their official festivities for security reasons. The independence festivities in San Miguel de Allende included a reenactment of the ride into town of the insurgents in 1810 and photo ops with giant street puppets masquerading as revolutionary heroes. The situation was far different in Dolores Hidalgo and San Miguel de Allende, whose very names honor independence heroes. Located in the picturesque state of Guanajuato—two centuries ago the hotbed of the insurgency, but tranquil today—both towns had spent months gearing up for the bicentennial. Monuments had been scrubbed, murals restored, and roads widened. Along practically every stretch of highway, “Ruta 2010” signs marked the routes of early campaigns. 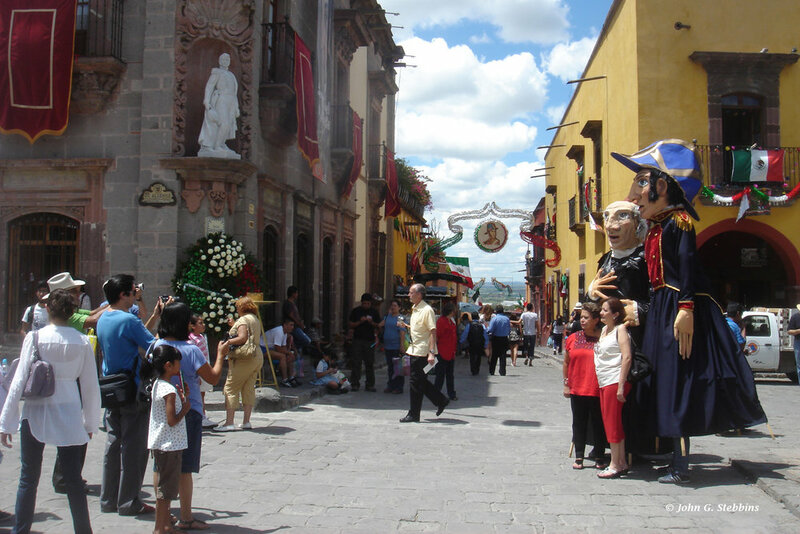 On September 15, San Miguel de Allende was in full celebratory mode. In front of its magnificent pink cathedral, giant mojigangas, or street puppets, masqueraded as revolutionary heroes—including Hidalgo, native son Ignacio Allende, and Josefa Ortiz de Domínguez—and posed for pictures. Every so often, a group of runners dressed in patriotic colors would race by, or riders wearing straw hats would trot down the street on horseback. Vendors hawked tricolor bracelets and hair bows and dresses and noisemakers. Concepción Salido Obregón sat with her daughter and grandchildren in the sunny jardín, as people in San Miguel call their leafy central plaza, enjoying the festivities. She brushed aside the idea that Mexico had too many problems to celebrate its bicentennial. “Every country has its problems,” she said. “This gives you a little bit of life,” she added, sweeping her arms to indicate the colorful scene. All afternoon, San Miguel de Allende residents, along with Mexican and international tourists, streamed into the plaza in preparation for that night’s annual ritual of the Grito de Dolores—the cry for independence reenacted in cities and towns throughout Mexico. This time around, it would be delivered by the city’s first female mayor, Lucy Núñez, before the town danced into the night. In Dolores Hidalgo, the September 15 celebration was simpler, though there too a throng gathered in the plaza in the evening. Because the town would be the site of a presidential visit and a special bicentennial Grito early the next morning, it didn’t stage its own reenactment but followed the 11 p.m. event broadcast live on big screens from Mexico City’s vast central square, or Zócalo. People cheered as they watched President Calderón deliver the traditional cry for independence, followed by a grand fireworks display that lit up the capital. Then the crowd in Dolores Hidalgo set out to dance for hours to live music performed by two popular Mexican bands, Sonora Santanera and El Recodo. A block outside the security perimeter, a local ensemble played in front of a closed bar and got passersby dancing in the street. By 5 a.m., the music was long over and the crowd in the plaza had thinned out considerably, though some revelers had stayed to get a better spot to view the morning ceremony. Other sleepy local residents were beginning to line up at the security checkpoints to get in. Gradually, the plaza began to fill up again. Around 7:15, as the first morning light appeared in the sky, President Calderón—who had first paid a ceremonial visit to the local Casa Hidalgo Museum—stood on the steps of Our Lady of Sorrows Parish Church, flanked by his family and state and local officials. He rang the church bell and echoed Hidalgo’s words from 1810, reading from a version of the speech as reported by a local resident of the time. 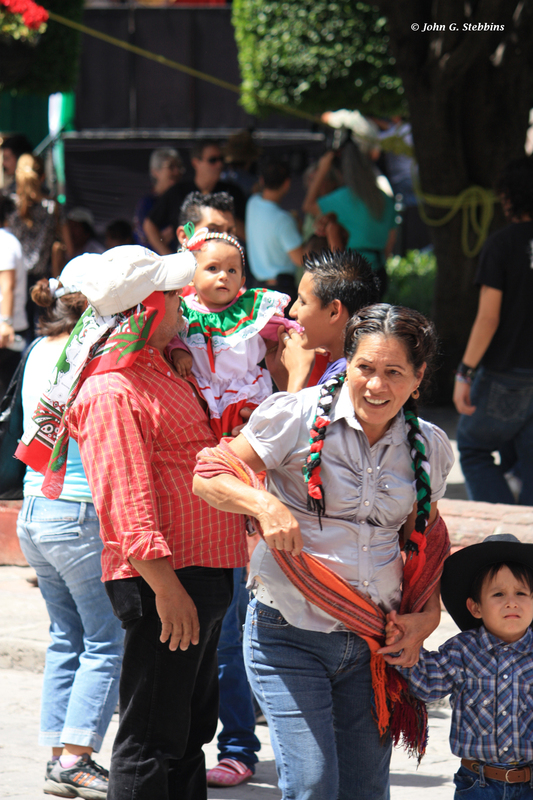 In San Miguel, families (and even the occasional pet) were decked out in the colors of the Mexican flag. 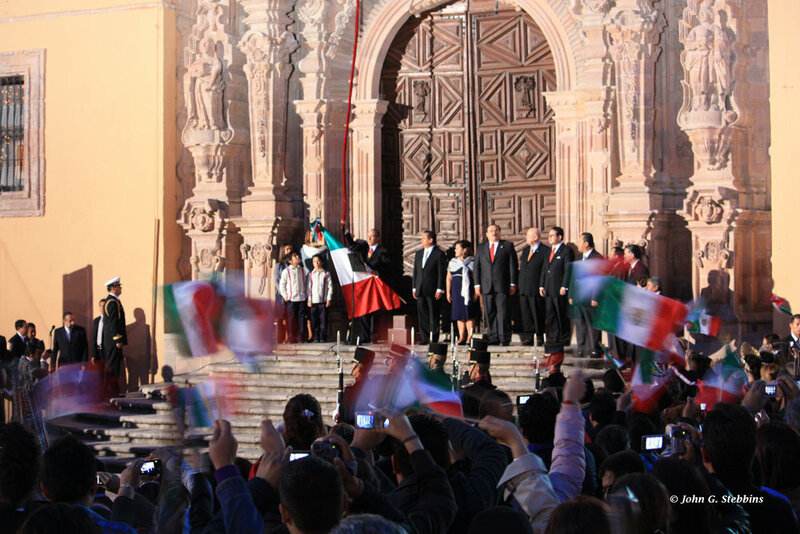 Throngs of people gathered at early dawn in the plaza in Dolores Hidalgo to hear a special rendition of the traditional Grito de Dolores delivered by Mexican President Felipe Calderón (below). After the brief ceremony, as bells pealed and showers of red-white-and-green confetti rained down, President Calderón and First Lady Margarita Zavala shook hands with dignitaries and greeted dozens of people on the church steps and at the front of the plaza before heading back to Mexico City, where he would preside over a massive military parade. The crowd in Dolores Hidalgo watched the presidential delegation’s three helicopters fly off then began to drift out of the plaza, some looking happy and others just ready for sleep. Later that day, September 16, San Miguel de Allende was still a lively place for parades and reenactments, including the ride into town of a group of horsemen dressed in period costumes. Led by Hidalgo and Allende impersonators, they were recalling the route of those first insurgents, who went from Dolores to nearby Atotonilco, where they retrieved the standard of the Virgin of Guadalupe from the church, then headed to San Miguel el Grande, as it was known at the time, to spread the revolutionary message and amass a fighting force. On this sunny Independence Day, people in San Miguel lined the streets to watch for the riders and a ragtag band of rebels who followed on foot. “This is the route the conspirators took,” a father explained to his daughter as they waited for a glimpse of the horses. Recalling that throughout history Mexicans had struggled against even greater obstacles and hardships, Calderón called on his fellow citizens to come together to build a better future: “We can only prosper if we are united. That is the great lesson of our history." Lorena Valladares, the lawyer who was camping out in the plaza in Dolores Hidalgo, would no doubt have agreed. In an interview before the Grito, she said she is fully mindful of the problems Mexico faces; her own state of Michoacán has seen its share of drug-related violence. Education remains the biggest challenge, she said, as people without any economic prospects often turn to the “easy money” offered by organized crime. Valladares hopes the dual anniversaries this year will serve to focus citizens’ attention on Mexico’s rich history and help the country become more united. Noting that the government had distributed a flag to every household, along with a copy of a book on Mexican history, Valladares said she has seen flags hung outside more homes lately.